According to the World Health Organization (WHO), over 2 billion people worldwide suffer from anemia, many caused by iron deficiency. In so-called developing countries, half of pregnant women and 40% of preschool children are estimated to be anemic. The WHO recommends dietary diversification including iron-rich foods and enhancement of iron absorption, food fortification and iron supplementation. Unfortunately, many of those affected by iron deficiency anemia don't have adequate income to be able to buy iron-rich foods such as red meat. The costs and side effects of iron supplements, including stomach upset and pain, constipation or diarrhea, nausea, and vomiting, may discourage their use. The idea is this. You take your 'fish', made of bio-available iron, and boil it for 10 minutes in slightly acidulated liquid. They suggest boiling the fish for 10 minutes in 1 litre (1 quart) of water with a teaspoon of lemon juice added. Each time, a small amount of iron, up to about 70 ppm, is leached into the water. The liquid can be soup broth, or stew or just plain water, as long as it is a slightly acidic. According to the company, after 12 months of usage, they saw a 50% decrease in the incidence of clinical iron deficient anemia and increased blood iron levels. 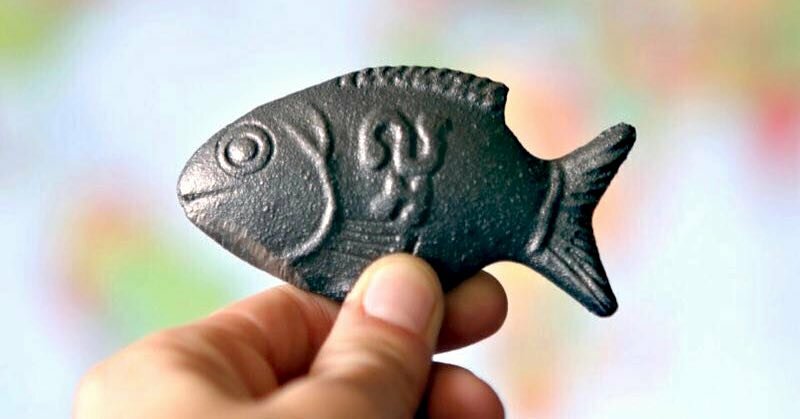 For each fish purchased, Lucky Iron Fish provides another free to a Cambodian family. The ones distributed in Cambodia are made locally, while those for international distribution are made in Canada. They also have a "School of Fish" that provides 5 fish to families in Cambodia or a lapel pin for which they donate two fish. Donated fish are distributed through local NGOs. Lucky Iron Fish is a certified B-Corporation, meaning they are committed to environmental and social causes, and not just profits. They have offices in Cambodia and Canada. To learn more, or to take part in their buy one/give one or other programs, visit http://www.luckyironfish.com/.